Tobi is just an ordinary reindeer, but is many times mistaken for a christmas reindeer which does bug him, but when kids come up and say something, he plays along and says he'll tell santa they've been good. kind, slow to anger, generally happy. he was raised around friends and family who cared about him greatly. some of his closest friends are actually women whom he doesn't mind talking to if they have a problem with their boyfriends or etc. He lives on a planet called Soung on a continent called Monter. He's lived their for years and never left the planet. the planet is full of many different lifeforms from humans and other anthromorphs to aliens. His hair and eyebrows are red whereas his eyes are the opposite, green. his belly is white that leads from his chest to his tail. 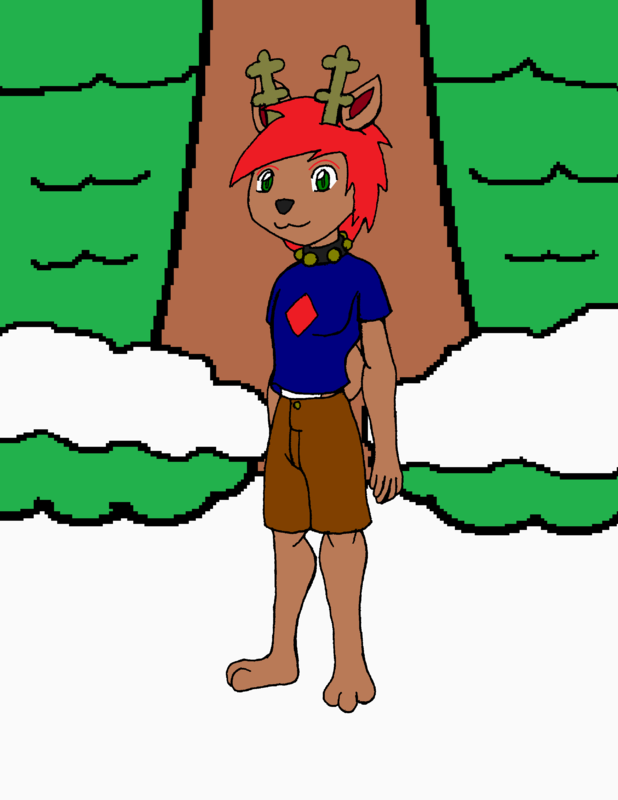 his fur is brown and his antlers are a slightly dingy goldish color. he's not that built. he usually has a backpack on that he carries his class work.